For most of us in the United States, Memorial Day means a day off of work and a barbecue. In fact we might not even think of those who have gone before to secure our freedom. You might remember I traveled to France in April. While I was teaching at the Paris event, my husband Jay and Dave Schuh (yes, Debby's husband) took a train/tour out to the Normandy coast to visit the WWII landing beaches, museum in Caen and the American cemetery. What a moving experience it was for them to visit these hallowed grounds, hear the stories of sacrifice and courage, and visit the cemeteries of those who did not return home. So please remember to say a little pray of thanks today for those that have served our country in the past as well as those serving today. And the topic you have all been waiting for....fabric. My, oh my I think a record was broken for the amounts of comments left on the blog to win the fabric. So much excitement surrounding the new fabric! DDWilson: Paula, your tutorials are wonderful! Samples, oh my....just what I was thinking about.....I bet that the fabric is a long time in getting to rural Montana! How fantastic did that lampshade turned out .. and hurray for glue guns! These fabrics are fantastic so if a little bundle by chance made its way to Italy I would be more than pleased. Lucky girls, please be sure to contact me at paula@2gypsygirls.com with your name and shipping information so I can get the fabric samples out to you asap. Beautiful post, Paula. Congrats to the winners, and thanks for your eloquent tribute to the heroes who keep us safe! Congrats to the winners...enjoy making ur new lampshades. 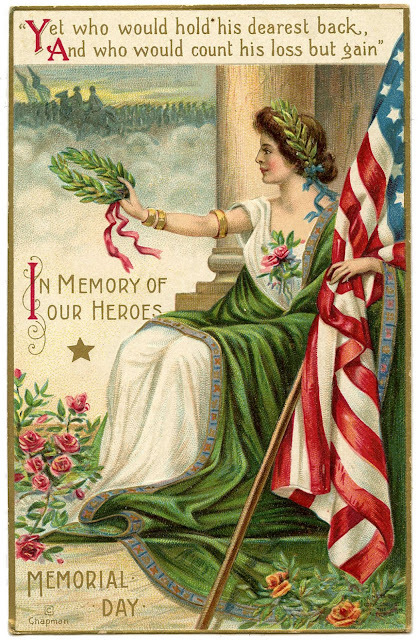 Happy Memorial Day to all and may we all remember those who helped preserve our freedoms. Congrats to all the winners. It is One Lucky Day for all of you! I dont understand why I am not getting your blog posts anymore. I have been following you over a year and all of a sudden they just stopped. I tried to sign up again and it says I am already a follower. Hmmmmmm. Miss seeing your blog posts but will have to remember just to go there manually.....unless you can solve the mystery. Congrats to the lucky winners of the fabric. so jealous! Suzieq23, this has been on ongoing problem with Blogger since about Feb. Currently working on changing my delivery service as Blogger is no longer supporting Feedburner. Very frustrating for me too. Please email me at paula@2gypsygirls.com and I can enter your email manually. Sorry. Congratulations to the winners! Beautiful post!